As 2016 winds down, it’s fitting in the quiet week before a New Year to consider the meaning of Black Elephants, Black Swans and the other metaphorical creatures of surprise, such as the boiling frog, who opened up this blog two years ago this month. There’s been a lot more attention given to them since then in other venues. It’s surprising but true. It’s equally surprising but true that the journey of many artists has, it seems to me, much to offer the rapidly changing world in which we find ourselves today–if we were to want to face up to these creatures of surprise. This is because artists often try to see beyond the surface impressions to get at the truth of things–that’s what gives art its special meaning to many of us. This concept covers the increasingly (but extraordinarily dangerous) popular tendency to avoid what the accumulated history of knowledge and scientific progress tells us to be true. And so, perhaps it is another “Black Elephant” to observe that these “elephants” may be multiplying right now (paradoxically and quite sadly as their real-life versions dwindle in number due to poaching and encroachment on their natural habitat.) 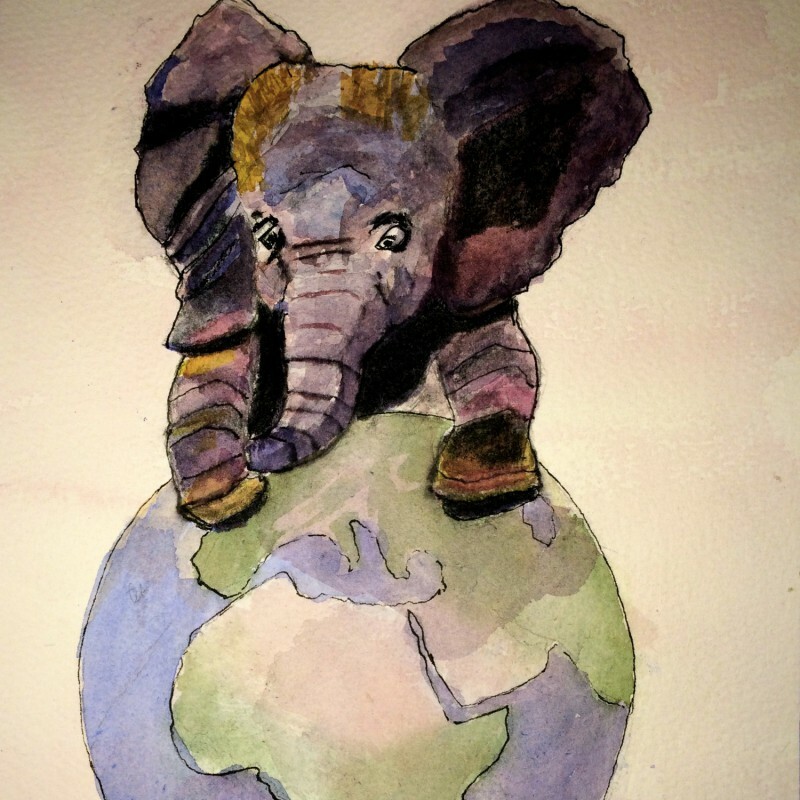 Facing up to these “elephants” is something that calls for well-honed critical and creative thinking skills–whereby people of all backgrounds including, of course, artists–join forces in shedding new light and creating new possibilities for dealing with the challenges of today in a fact-based way. This is in fact how mankind has conquered so many diseases that previously killed so many in childhood. Understanding how innovative breakthroughs occur,and accelerating our society’s capacities for innovation in so many sectors, are right now key to survival on a collective level. Fortunately there is more awareness of these challenges, as well as our own inherently human desire to ignore them–aided by the fact of more frequent “black elephant” and “black swan” events in the last two years alone. It turns out this awareness extends well into the suites of CEOS around the world. I refer in particular to a recent paper, Thinking the Unthinkable: A New Imperative for Leadership in a Digital Age, which I’ll turn to soon. Last month I had an opportunity to hear the authors brief an audience on their research findings, and found their conclusions compelling enough to include in a revised syllabus for the coming semester of classes. Interestingly, they too distinguish in their report between “Black Swans” and “Black Elephants”; the creatures of surprise are everywhere! But for now with another spring-like day of temperatures in the 60s Fahrenheit, it’s time to be out enjoying the warm December weather, and re-charging our own personal energy reserves for what promises to be a challenging 2017! Best wishes to all for a joyous New Year! Painting in the outdoors, or “plein air,” is a popular past-time for artists and great practice for everyone who wants to learn to appreciate their surroundings with new eyes. I am most likely to be found doing this on weekends when I have painting pals who want to be outdoors. But a few (most, actually) of the people with whom I correspond do not have much time to paint whether in or out of doors, so I thought I’d write a post about what art is teaching me about readiness for the unexpected. The other day, I found myself in a setting devoted to sustainable gardening and wild meadows where my subject turned out to be a small garden statue of the ancient Greek god of the wilds, fields, and flocks, Pan, with his man-like body and a goat’s hind legs. The word “panic” is derived, I’ve since learned, from Pan’s name. This subject promised to be challenging, especially given changing circumstances. Sunlight vied with overcast skies, changing the shadows on the figure every few minutes. In addition, a wedding was scheduled for these very grounds in a short time, so planning ahead was of the essence. First off was a quick sketch to familiarize myself with this scene, and gain some idea of lights and darks. Such a sketch can boost confidence for the next step, though it is true that you never know how a sketch is going to turn out and many sketchbooks, like diaries, are private partly for this reason. Nor, increasingly, do we know what we will face, so sketching (or a rehearsal or a “scenario”of any kind) is a way to increase our readiness for the unexpected, a subject that received more attention in the early days of this blog. Topping off this day of plein air painting was the opportunity to see the movie, “Sully,” on the inspirational pilot and the first responders on that incredible day when a fully-loaded passenger plan had to land on the Hudson River. From painting Pan in the wilds, I was confronted with wild scenes that would leave most of us panic-stricken if we were in the midst of them. But this is a film of human strength and prowess, strong team work, and genuine leadership. From the pilot and his co-pilot, to the crew, the ferryboat operators, air traffic control, and many other responders, the rapid response to this unprecedented event demonstrated the value of consciously preparing (across disciplines, stovepipes, and other boundaries) for the unexpected. In this case, one imagines that such pre-crisis teamwork contributed to enhancing preparedness for an unprecedented situation. Remembering the importance of the “human factor”, as per Sully when he explains himself to the NTSB (National Transportation Safety Board), is the critical difference. His performance seems to be an example of “rapid reflection” crisis management in action; this film carefully adheres to the facts of the crisis as it actually unfolded and, therefore, truly is a “must-see” for all those in top management, whatever the field. I’ve been reminded regularly that true artists respect unintended consequences whereas experts of other stripes too often don’t. Artists regularly experiment with techniques and materials, and absorb others’ approaches like sponges; many experts of other stripes too often don’t. There is seemingly an important paradox in this. In an age when many clearly believe it is more acceptable to bash experts than to emulate them, the aspiring artist knows that study of others’ solidly perfected techniques–and, beyond this, historical appreciation as to what has been humanly possible and achieved over time–leads to greater consciousness of our individual shortcomings and more rapid recognition of the truly exceptional (as the film, Sully, also reminds us). Recognizing these gaps can inspire us to be more curious and to learn more. At the same time, experts themselves must prepare for circumstances never before seen (and, thus, for which there is no sketch, textbook or field of expertise). Indeed, a certain cognitive and doctrinal flexibility seems necessary, at a minimum, lest very deep expertise lead us to think that everything can be scripted, measured, and predicted ahead of time–as the differences between the NTSB and Sully demonstrated in the film. The artist with skill in applying paint (or ink or any other medium) to paper or canvas–and expertise such as pilot Sully’s extraordinary tacit knowledge of the limits of his airplane, his ability to derive quickly from different inputs the most sensible course of action, as well as his abiding awareness of the value of human life–demonstrate human capacities that total reliance on computers, for instance, or checklists can never achieve. So, while it is true that you generally don’t want the pilot of your commercial jet to be creative in getting you from point A to B, the movie, Sully, does show us that adaptation in the face of the unexpected requires a degree of mindfulness (and openness to ongoing learning) that cannot be assumed. At their best, therefore, artists and experts of all types, whether commercially successful or not, seem to combine deep knowledge with a degree of cognitive flexibility that is hard to sustain from deep within “stovepipes” of all types, from academia to industry. Dealing effectively with this conundrum seems to me to one of the most important things we could do these days. During a plein air competition this week hosted by The Arts of Great Falls, Virginia, I had the opportunity to work on the grounds of one of the top French restaurants in the Washington, D.C. area, L’Auberge Chez Francois. Braving unseasonably hot days (over 90 degrees!) was made easier by the very attentive staff of this deservedly highly-rated restaurant, who came outside to the patio dining area several times to offer a cold glass of sparkling water or iced tea. This was very thoughtful, and probably outside their job description as their paying customers were inside the air-conditioned restaurant. As it happened, I had my own ice water with me so did not need to accept their offers but their hospitality made what could have been a somewhat uncomfortable setting (due to the heat and occasional biting bugs) more pleasant. This experience is yet another reminder that ‘plein air’ is dominated by oil painters, it seems. The history of watercolor’s admission into the ranks of accepted mediums for serious art is a fascinating one on which I started a blog post some months ago, and may try to finish soon. These on-site ventures out into the world of artists (and gracious restaurant staff) are fun tests of one’s ability to frame and execute a concept quickly. My approach was to go out one day and scout the place for a scene, and then to sketch it in pencil. The following day I set aside three hours to do the watercolor. My hope was that the white tablecloths of the scene would provide a brighter contrast; the end result was less effective in this regard than I wanted, but dissatisfaction can be a powerful motivator. In any case, I popped it into a frame and the sponsors now have it on display. How fun! And I will be happy to take it home again, if it doesn’t sell, as a memory of this experience. But, our classroom process differs from standard scenario practice, though the goals remain similar. Having just considered case studies in the importance of “reframing the question” in order to design more effective problem-solving approaches to complex challenges, the students (who come from all over the world) have been given an intentionally unbounded rapidly-unfolding crisis situation in the form of a very sketchy sketch. This scenario is ambiguous in terms of ‘ownership’ or national or jurisdictional boundaries or even the exact facts on the ground (simulating reality). The students must even decide “who” they are in this simulation, in devising their plans by next week. Time is short, the situation completely unfamiliar, and two subgroups are working, respectively, in pre-crisis and post-crisis modes. Within these groups people must work together outside of their usual lanes and routines. There is no one in charge, at least initially. Usually the results are pretty impressive, surprising, and it’s a fun, albeit serious, way to end the semester. We all learn something in the process. We naturally start with sketches whether we are contemplating building a new deck on the house, designing a new organizational initiative, imagining something which we don’t see, or drawing a cartoon. Sketching has a role in seeing, as emphasized quite dramatically this very week (!) 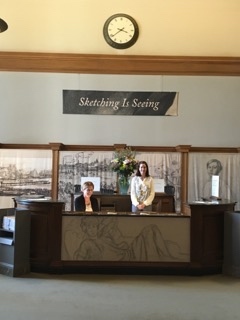 by a whole room devoted to sketching (complete with free sketchbooks and pencils) at the entrance to the National Gallery of the Art in Washington, D.C. So sketches can be something we draw, or practice (as on a stage,) or simulate in a classroom or a video game. Meanwhile a gorgeous Spring has provided the perfect palette to practice sketching in different media. Toggling between so many sketch-able things has produced many “works-in-progress” and aspirations to finish them! It turns out, as many teachers have said over the past year, process matters if we are to make progress on tough challenges (whether in art, education, public health, or security matters) and create better outcomes. Complacency and routines can be deadly in this regard. How curiously different is the world of artists from the world of those in many other professions. Artists must be original in order to have a chance at being successful, much as Georgia O’Keeffe was in adopting her various styles. But so many other professions discourage originality in part because it’s impossible to manage traditionally. As more and more challenges at the level of cities, regions, nations, and the world at large demand originality and creativity, traditional organizations are stumbling, although some are trying to adapt. It’s a tall order for most of them, but necessary. Would we better off if creativity and originality were emphasized, rather than stifled, beginning in primary school? One wonders. Meanwhile, it’s no wonder sketching is catching on like wildfire: sketch away!